Both teams were in need of the points: Coasters having suffered back-to-back defeats for the first time since February. Wood were winless in five but had won two of last season's three encounters with Fylde, drawing the other. Fylde made one change from the side defeated at Dagenham & Redbridge as Zaine Francis-Angol came back from international duty to replace Andy Bond, who was injured after scoring in east London. The Wood had top scorer Josh Umerah back in their starting line-up. The striker soon made an impact as the visitors started brightly, getting goalside of Jordan Tunnicliffe on eight minutes. 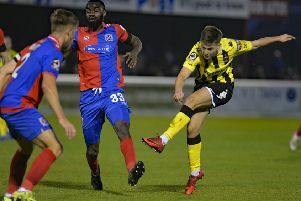 Umerah went down under the defender's challenge but referee Andrew Miller ruled there had been no infringement, a relief to Fylde as Tunnicliffe risked a red card had the official taken a different view. This shook Fylde into life, with Gime Toure looking to pose problems with his direct style in the middle of a front three. He was soon in the wars after good work by Nick Haughton and Francis-Angol resulted in a cross to Toure at the near post. He came off worst in a challenge with keeper Ryan Huddart and was forced off to change his blodk-covered shirt. Toure was soon back in a clean, numberless shirt and continued to make himself a nuisance. The front man was involved in the Coasters' best chance of the first half as his great work down the left released Francis-Angol. His cross found Haughton eight yards out but the midfielder's side-footed volley lacked the conviction to beat Huddart. Fylde went close again after half and hour when Danny Rowe, playing down the right and wriggling free into space, fizzed a ball across the face of goal towards a full-stretch Danny Williams, whose goal-bound effort diverted for a corner. The hosts ended the half on top thanks in part to Ryan Croasdale, who was tireless in midfield against a physical side, breaking up Wood's attacks and continually driving his team forward. If the first-half was a little cagey, the second was anything but. Again Boreham Wood started the better and had a great chance three minutes in, when a pinpoint free-kick found Jamal Fyfield unmarked but he headed into the side-netting. A threatening spell from the Coasters saw Williams cut the ball back for Toure but his effort from 10 yards was palmed away by Huddart. The resulting corner was cleared only as far as Rowe on the edge of the box and his left-footed half-volley on the turn clipped the crossbar. Boreham Wood’s best spell of the game followed as chances fell for Gozie Ugwu and Fyfield, who forced Fylde keeper Jay Lynch into a fine two-handed save. The visitors continued to push and were rewarded on 58 minutes with what looked like a training ground routine. Ugwu was alert to Danny Woodards' ball into the box, nipping beyond the central defenders to steer the ball home. As the Wood looked in control, Challinor made three substitutions and these seemed to have an effect as Haughton beat a man on the edge of the box only to see his ferocious effort fly just wide of the right post. Buoyed by this, Haughton was instrumental in the equaliser, sliding hte ball through to Rowe on a quick counter-attack. Mill Farm held its breath as the hitman cut inside on to his left and curled a shot beyond the helpless Huddart for his 13th league goal. Coasters fans may have considered the draw a fair result but Serhat Tasdemir had other ideas. Latching on to a lay-off by fellow substitute Ash Hemmings, Tasdemir fired a low, powerful effort home within a minute of Rowe's strike to send the Fylde faithful crazy. Challinor admits a draw would have been a fair result. The Fylde boss said: “It’s tough as I know Luke (Garrard, Wood manager) well and we talk as two young managers in the division. “I don’t think they deserved to lose but I don’t think we did either. “When you get so late into a game, you’d probably have taken a point, and one we would have deserved. “We weren’t fantastic but we didn’t deserve to lose and to win it is obviously great. Fylde: Lynch, Francis-Angol, Tunnicliffe, Byrne Burke; Croasdale, Philliskirk ( Kellermann 81), Haughton; Williams (Tasdemir 67), Toure (Hemmings 81), Rowe; not used: Birch, Brewitt. Boreham Wood: Huddart; Champion, Fyfield, Parry; Woodards (Thomas 89), Ricketts, Shakes, Murtagh, Ilesanmi; Ugwu, Umerah (Shaibu 75); not used: Ash, Smith, Burbidge.